Miss Mexico Jimena Navarrete was crowned the new Miss Universe 2010 out of 83 beautiful contestants around the world. The Miss Universe 2010 Beauty Pageant was held on August 23, 2010 in Mandalay Bay Events Center at the Mandalay Bay Resort & Casino in Las Vegas, Nevada (Philippine time: August 24 morning). Navarrete exudes such elegance, beauty and grace. The prestigious competition was hosted by Bret Michaels and Natalie Morales. All the Filipino communities around the world were jubilating of the success of our contestant Miss Venus Raj from the Philippines after placing 4th runner-up. This is the only time that our country made it to the semi-finals/ finals since 1999 when Miriam Quiambao of the Philippines won 1st runner-up in the Miss Universe 1999. Raj was the only Asian who made it to the Top 10. She is so graceful and positive in her outlook that made her one of the judges' favorites. Other winners: First Runner-up is Jamaica (Yendi Phillipps), Second Runner-up is Australia (Jesinta Campbell), and Third Runner-up is Ukraine (Anna Poslavska). I am surprised that there were no commentators during the pageant and it only happened this time. I don't know why. For each round of the competition, this is also the only time that the scores of all the judges were not shown on screen, but only the average scores of each contestant. Normally, after each round of competition, the commentator/s or a co-host would show the ranking of all the women with their corresponding scores on the TV screen and say a few words about the turnout of the competition round. There were nine (9) telecast judges: Chazz Palminteri, Chynna Phillips, Criss Angel, Evan Lysacek, Jane Seymour, Niki Taylor, Sheila E, Tamron Hall and William Baldwin. Then there were seven (7) preliminary judges: Basim Shami, BJ Coleman, Carlos Bremer, Corinne Nicolas, Louis Burgdorf, Natalie Rotman and Sadoux Kim. 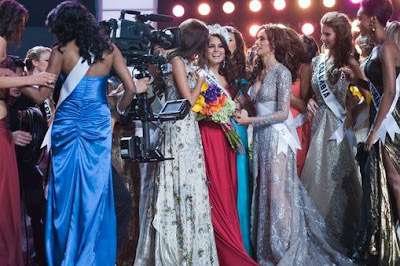 To view the list of all the 83 Miss Universe contestants around the world, click here. The following were eight (8) countries who withdrew participation from the Miss Universe 2010 competition: Bulgaria, Cayman Islands, Estonia, Ethiopia, Iceland, Montenegro, Namibia, and Vietnam. The following were eight (8) countries who returned to participate in the Miss Universe 2010 competition after last year's absence: Botswana, British Virgin Islands, Denmark, Haiti, Kazakhstan, Sri Lanka, Trinidad & Tobago, and US Virgin Islands.